Are you a fan of Dragons Den? It’s a ‘reality show’ where entrepreneurs face a team of potential investors and try to persuade them to invest money into their business in exchange for a share in the business. Naturally, for it to make good television, there has to be a certain amount of drama… a few completely bonkers ideas, a bit of confrontation, and the occasional good news story. This weekend, we watched Lisa and Helen, from Sweet Mandarin, pitching to the investors for some money for their gluten free Chinese table sauces (sweet and sour, sweet chilli and barbeque). They wanted £50,000 in exchange for 20% of their business. Initially, there were some negative comments about the brand not being unique, the margins being tiny, and it being a niche market. The Dragons didn’t seem to understand the significance of the fact that the sauces are gluten free—despite the fact that we were all shouting at them. Don’t they know that we don’t eat Chinese any more because we didn’t think our daughter could? Don’t they see the potential? Lisa and Helen did explain the size of the dipping sauce and condiments market (£600m per year, growing at 16% per year) and the size of the gluten free market (they said £200m per year, but I think it might be larger). But it wasn’t until Lisa and Helen explained that Wing Yip have ordered 50 cases per week (50! ), and that they are in discussions with big retailers, that the Dragons really started listening. (Wing Yip, for those of you who don’t know, is the biggest and most famous Chinese food supplier/superstore chain in the UK). In the end, Lisa and Helen had offers from all 5 Dragons, and chose to work with 2 of them, in exchange for 40% of the business. Yay for Sweet Mandarin! they did mention a cookery school, in passing – and it turns out there’s a gluten free Chinese cookery course in November this year. Who fancies eating Chinese? A good news story indeed. I was so excited when I watched Dragon’s Den and saw this product. I’ve been a coeliac for 7.5 years and my eldest son for four years, so this is a great product for us. I miss chinese so much and these sauces have created a lot of excitement in the house. 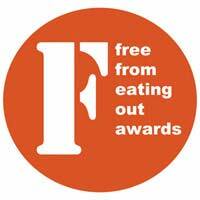 Let’s hope more companies follow suit and start introducing 100% gluten free products. We were excited too! And we’re planning to make a special trip to Manchester to eat Chinese at the Sweet Mandarin… My coeliac daughter is 16 now; that’s a long time to go without trying chinese food! 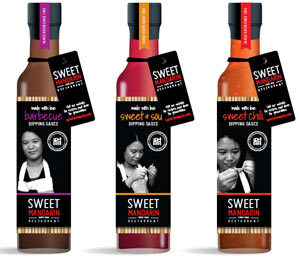 Do let us know what you think of the sauces when you get a chance to taste them.